The tenth edition of the Economist Intelligence Unit’s Democracy Index ranks Brazil as a "flawed democracy." The magazine has lowered its score from 7.38 in 2014 to 6.86 in 2017. Although one should be skeptical about the taken-for-granted liberal notion of democracy and although one wonders if "flawed" is the correct word for an authoritarian, sexist and racist society as Brazil, the index presents useful tips to read the current crisis that Latin American's largest ‘democracy' is facing once again. Contrary to the past, now there is no military junta, the Congress is working just fine, and the media enjoys greater freedom. This time, the main threat is posed by part of the judiciary, a dangerous well-born, conservative, and mainly white special class of homens bons (good men) that have taken in its hands the "civilizing mission" to free the country from corruption. The mission seems noble – after all who would be against it within a context in which the political system is discredited? The Workers Party is the prey to be sacrificed in the altar of hypocrisy. However, the hidden agenda is other: to outlaw the Workers Party (PT) and to open the door for new waves of aggressive neoliberal reforms. It is true that some politicians across the political spectrum have been targeted but the highly selective and slow-motion investigations consistently end where it should begin (see for instance the politicians from the former president Fernando Henrique Cardoso's Social Democracy Party and media conglomerates/bankers supposedly involved in fiscal frauds). The Workers Party is the prey to be sacrificed in the altar of hypocrisy. Brazil's Chief Justice Joaquim Barbosa, the first black judge appointed to the Supreme Court (STF) (under Lula da Silva's administration) played a central role in opening the door for the hunting of PT. Perhaps because of that, he became highly popular among the white right-wing media and business circles. During the 2005 "trial of the century" (the so-called mensalao bribery scandal) he imported German legal scholar Claus Roxin's theory "dominion over the act" or "mastery of the fact" theory to recommend sentencing high-profile figures of the Workers Party to twenty-five years in prison supposedly for ‘knowing' about the bribery system in the Congress to approve Lula da Silva's programs. Too late Dilma Rousseff discovered that “their project is a democracy without people,” a democracy sanctioned by the market. Back then the narrative was established: PT is a criminal organization. 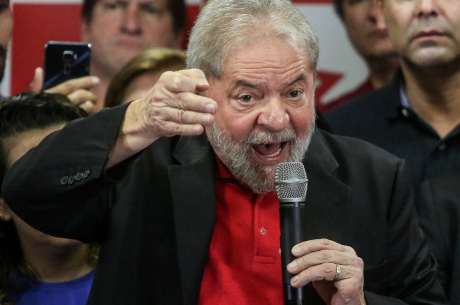 With an unbeaten popularity, Lula and his party survived the mensalao scandal but they also naively underestimated the coalition judiciary/media/bankers. Too late Dilma Rousseff discovered that “their project is a democracy without people,” a democracy sanctioned by the market. The power of the judiciary/media/market coalition came into full display in 2016 when the Supreme Court played important role in approving the impeachment proceeds against her. Led by former president Cardoso and the then Rousseff´s vice president Michel Temer, the Congress falsely accused her of mismanagement of the national budget. The STF manipulated the political agenda with statements from its ministers in support of the impeachment, closed its eyes to the illegalities of the process and has not yet tried the habeas corpus impetrated by Rousseff. Lula da Silva is the elite's nightmare. "Dead he is a martyr, jailed he is a hero and freed he is president." Pregressive lawyers, judges, legal scholars agree that the cases against him are an aberration. They also agree that this is a concerted effort by selected branches of the Federal Police, some lower court judges, and of course, some ministers of the Supreme Court where anti-PT rhetoric finds its hypocritical and sophisticated form in legal speeches wired alive on TV. Lula is under at least five fronts of investigations accused of being "the head of the criminal organization." With the whole apparatus of the state in full display against him, his sentence comes as no surprise. In the first process in which he was accused of receiving an apartment to lobby for public contracts with a construction giant company, he was sentenced to nine and then twelve years in prison. Although polls show Lula leads the field, the judiciary seems deeply committed to removing him from ballots. Lula is not the owner of the apartment, as a federal judge in another jurisdiction ordered the public auction of the unity to pay for the real owner´s unmet financial obligations with creditors. "The problem is that the narrative has already been created and they have to conform to that script," Lula has constantly denounced. In vain. There are no doubts that other sentences will come and he is likely to be barred from running in the next presidential elections in October. Although polls show he leads the field, the judiciary seems deeply committed to removing him from ballots. Strategies go from judges lobbing in Congress for a constitutional amendment to implement a semi-presidential system, to speeding judiciary procedures to have his case judged before electoral calendar, and to synchronizing decisions in lower court and court of appeal. Lula seems to be a political currency for judges longing for fame. Celebrity Sergio Moro, the federal lower court judge in charge of Operation Car Wash, has made a meteoric career as the hangman of "the most popular politician on earth." Moro was elected the personality of the year, has attended public forums by the conservative anti-PT´s media, has appeared in photos with politicians under investigation for corruption, and has used social media to ask for popular support in his battle against corruption. Under the high appealing banner of cleaning Brazil from corruption, the judiciary joins the elite pushing a new phase in neoliberal policies that are wreaking havoc the lives of millions of Silva. Sergio Moro, his friends in the regional court who upheld his decision and the public persecutors who offered the denounce against Lula are all part of the educated, well-born, urban Brazilian white elite. Lula, on the other hand, is a Silva, the most common surname in Brazil. To be a Silva is most likely to belong to the other side of the country's geography of opportunities and privilege of his hangmen. Under the high appealing banner of cleaning Brazil from corruption, the judiciary joins the elite pushing a new phase in neoliberal policies that are wreaking havoc the lives of millions of Silva. And this promiscuous relation is not just in terms of economic and financial assault on Brazil, though structural adjustment policies. As legal scholar Luciana Zaffalon has shown in her recent work on the judiciary system in Sao Paulo, there is a symbiotic and predatory relation between judges, persecutors and elected officials in Brazil, with a deadly consequence for the poor. For instance, in Sao Paulo where the state police kill more than the whole US police force in a given year (in 2017 alone the police killed 939 civilians), the Public Attorney file at least 90% of the cases allegedly for lack of proof of wrongdoings. Judges, on their turn, have a troubling record of deciding favorably to the state in 93% of human rights activists' legal demands. Neglecting investigations in cases involving officers misconduct, denying parole and even denying hot shower for inmates with tuberculosis... these are some of the common expedients Zaffalon found in the criminal justice system. That is why Lula´s fate is also a national tragedy for the Brazilian poor. Worse, she has also found a consistent pattern of transfer of public money, by Sao Paulo´s government (through discretionary reassignment and budgetary adjustments), to the same branch of the judiciary favoring the government in judiciary processes. As the saying goes, one hand washes the other, and both are washing the face! Lula is an accident in the Brazilian brutal history. His election and re-elections in 2003 and 2006 represented a watershed in the ugly trajectory of a racially and class-divided country that has been ironically named as "Belindia" (Belgium and India). If the judiciary can go that low against Lula, imagine against social activists and ordinary citizens who fall daily into the hands of a brutal, discredited and beyond repair judiciary system? Lula da Silva is more than a name. He is an accident in the Brazilian brutal history. His election and re-elections in 2003 and 2006 represented a watershed in the ugly trajectory of a racially and class-divided country that has been ironically named as "Belindia" (Belgium and India). It is not to say that the Workers Party changed the structural abysm between white and blacks, north and south, the favela and the jardins (wealthy neighborhoods). One cannot regard as a revolutionary a government with a reformist platform to create "a country of middle-class families," or a government that refused to revise the draconian legislation on media ownership, or a government based on class conciliation. His too pragmatic approach brought Lula, his party, and the left to where it is now. And yet, those at least skeptical of Lula's innocence should pause and consider why he is the most hated political figure among the rich, well-born, perverse white elite of Brazil. Why do TV Globo and Folha de S. Paulo (the most ferocious, insidious and beyond-repair news corporations) have demanded his political death? Until alternative narratives of what is going on are established, our duty is to defend Lula' biography not because his fate is unique (it is not) but because it speaks volumes about the bankruptcy of the Brazilian judiciary. Decades down the road when serious historians look back at the current events in Brazil, they will find striking similarities with other moments of my country's history when a concerted effort by a branch of the judiciary, media conglomerates, international corporations and "strange forces" in the global North prevented its people from being the owner of its own destiny. One thing is positive: for those of us who, despite our skepticism still held some hope on ‘democracy' and saw the judiciary as "the last front to defend citizenship," the time of innocence is over: it is antidemocratic to the core. Still, what we are witnessing is not its failure but rather, the recalibration of democracy to its normal course of actions after some progressive pit stops along the way. Time to burn it down and invent something else? Despair, rage and civil disobedience.